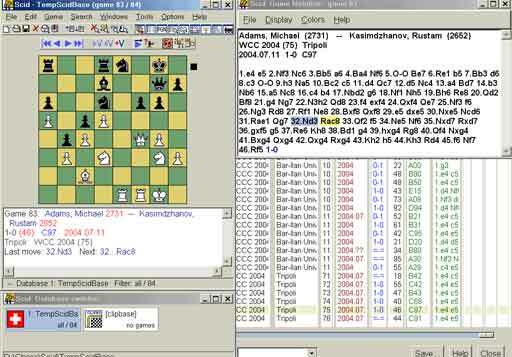 Lets talk now about free Linux chess software - the program-shell SCID. The name is decrypted as "Shane's Chess Information Database", and its author is Shane Hudson, site http://scid.sourceforge.net). By the way about languages - an interface is a multilanguage, but among 13 languages for Russian, unfortunately, a place was not found (you can correct this failing - write to author). Lets get the hang now with work in SCID. Frankly speaking after long work with ChessBase it was unusual, but literally after a couple of minutes it was everythinh OK. Causing them is possible through the menu of Windows or pushing the button on the bar of tools. It is also possible to cause a window Comment Editor - for the correction of comments to party (in SCID it is possible even to add graphic comments as in ChessBase!). SCID uses own format of storage, and although supports an import/export PGN it creates certain inconveniences however. But dont judge strictly - in fact SCID is fully able to satisfy Your everyday queries as practicing chess-player! Conclusion: SCID - simply rescue for users *nix systems (write us about Your experience of the use SCID for *nix) and excellent find for the users of not persons interested to pay imposing sums for ChessBase/Chess Assistant. Carry on, Shane Hudson! !